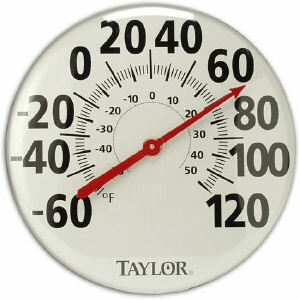 Extra-large 18" diameter thermometer in a brushed silver metal bezel. Red pointer. Temperature range -60°F to 120°F and -50°C to 50°C. Weather resistant and rustproof. Bold, easy to read face with brushed silver metal bezel. Rustproof, weather resistant, shatterproof lens.